‘Bliss’ is an image of a green, lush hillside, partially lit by bright sunshine. Above the hillside there’s a bright-blue sky peppered with cumulus and cirrus clouds. Low down in the frame, a dark line indicates a division between fields, and the foreground is dotted with yellow wildflowers. Beyond the gracefully sloping hillside, distant mountains are visible. Critics might argue that the image is bland and lacks a point of interest, while supporters would say that its evocation of a bright, clear day in a beautiful landscape is itself the subject. However, is it even a real landscape at all? Many have wondered whether it is actually a computer-generated scene, assembled in Photoshop from a number of different images. Although it’s a picture that can divide opinion, it is, nevertheless, one of the most famous photographs in the world. It is familiar to perhaps billions of people as a result of being chosen as the default ‘wallpaper’ image in the Windows XP program, launched in 2002. However, few people who recognise the image would be able to name the photographer: Charles O’Rear. At the time the photo was taken, in January 1998, O’Rear was 56 and had enjoyed a successful career as a professional photographer. He initially worked on The Kansas City Star and Los Angeles Times before shooting a wide range of assignments for National Geographic. The major turning point in his life came in 1978, when National Geographic sent him on an assignment to photograph winemaking in Napa Valley, around 50 miles north of San Francisco in California. O’Rear fell in love with the region and afterwards went to live there permanently, settling in St Helena. He also began to specialise in photographs of winemaking, initially concentrating on the vineyards of California, but later going on to photograph wine production around the world. However, he particularly enjoyed photographing the lush landscape near his Napa Valley home and one hillside caught his eye while he was driving to the nearby town of Corte Madera. It’s visible from a point on Highway 121 in Sonoma County and although it’s located in the winemaking region, it was not planted with vines. It’s the kind of scene which, photographed on a dull day, would struggle to capture anyone’s attention. However, on one bright, partially cloudy winter’s morning with the sun in the right position, it took on an almost dreamlike quality. He photographed the scene using a hand-held Mamiya RZ67 film camera and the resulting picture was submitted to the Corbis picture library, owned by Microsoft chief executive Bill Gates. When the company’s software engineers were looking for a default screen saver for the new Windows XP program, launched in 2002, O’Rear’s hillside shot was the image chosen. They gave it the title ‘Bliss’. This version of ‘Bliss’ is O’Rear’s own personal image file. It shows that Microsoft made very few changes to it, beyond cropping the image on the left side of the frame. The most significant change was to alter the colour of the hillside to a much more vivid green. For such a famous photograph, O’Rear says it was almost embarrassingly easy to make. ‘Photographers like to become famous for pictures they created,’ he told the Napa Valley Register in an interview in 2010. ‘I didn’t “create” this. I just happened to be there at the right moment and documented it. The photograph was not only included in every copy of Windows XP sold around the world (a program installed on more than a billion computers), but it was also a key part of the $200 million campaign to advertise the software. As such, it was a valuable image and O’Rear was paid one of the highest fees ever for the copyright of a single photograph, although for legal reasons he’s unable to reveal the exact sum. So what made Microsoft choose the image above all others? O’Rear has never been told, but the fact that it’s attractive, easy on the eye and doesn’t detract from other items that might be on the screen are all contributing factors. It may also have been chosen because it’s an unusually inviting image of a verdant landscape and one that promotes a sense of wellbeing in desk-bound computer users. 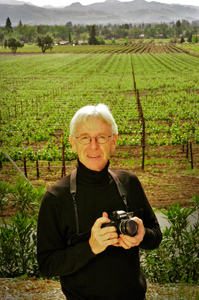 Books: Charles O’Rear has produced the images for ten books on wine and vineyards. The most recent is Napa Valley: The Land, The Wine, The People (published 2011). Websites: To see more of Charles O’Rear’s work, visit his website www.wineviews.com. It includes portfolios of his stock and fine-art work, including more images of the rolling hills of the Napa Valley.